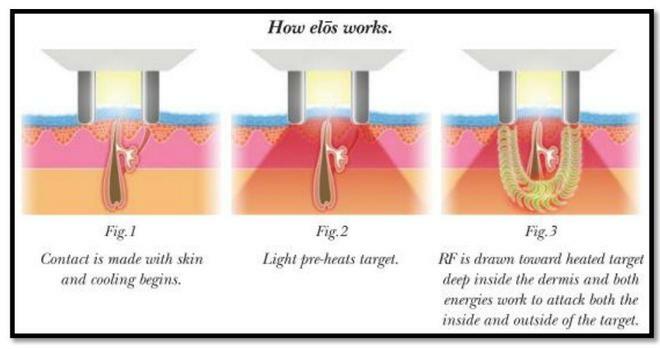 E-Light technology combines optical energy (IPL) and radio frequency (RF). The synergistic effect of these energies heats and destroys the hair follicle without harming the outer layers of the skin. 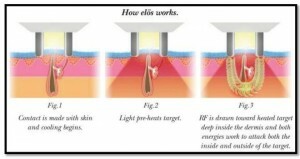 IPL used alone has proven to be less effective than the combination of IPL and RF. Now with E-Light the results are more satisfied clients with fewer treatments required. (Individual results vary). E-Light hair reduction is not painful. Some compare it to a rubber band snapping against the skin. E-Light technology has a cooling tip which reduces excessive heating. You should begin to see results 2 – 3 weeks after the first treatment session. All laser hair reduction is only effective in killing the hair follicle in the active growing cycle, therefore you will need 4 – 6 treatments approximately 6 weeks apart, depending on the area being treated. Along with hair removal, E-Light depilation also enhances the production of elastin and collagen, whcih strengthens and firms the skin. Find out if you could benefit from E-Light Hair Reduction.